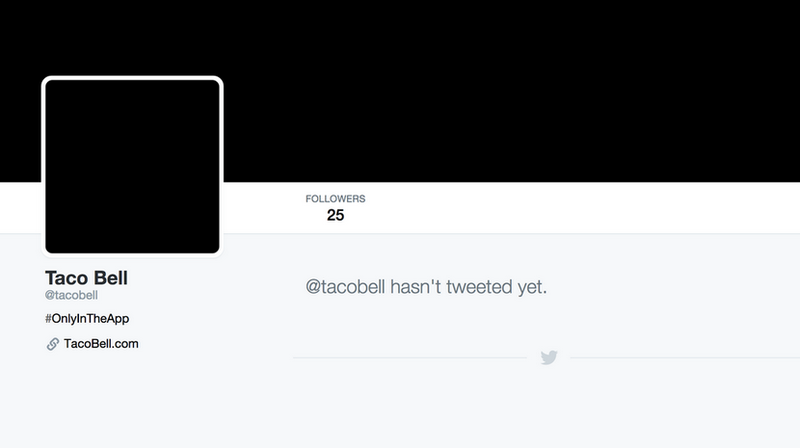 Taco Bell erased its Twitter feed and turned its website black to drum-up anticipation for its new order-ahead app. Guests coming late to a party tend to like making a grand entrance. Apparently that’s Taco Bell’s plan as the company blacked out its social media and internet presence in an attempt to drum up excitement for its latest innovation: an app that lets customers order meals and prepay. Sound familiar? That’s because Starbucks, McDonald’s and other eateries have already announced similar services. USA Today reports that Taco Bell plans to unveil the new app sometime this afternoon, and until then the company’s website, Facebook, Twitter and Tumblr accounts will remain darkened. The social media sites and the website will eventually provide a link to download the new app, while customers with the company’s previous app will get an automatic update on their mobile device. Much like the previously announced McDonald’s app, the new Taco Bell tool will allow customers to order and pay for their food using their smartphones and then either pick up their food inside a restaurant or at the drive-thru. Although McDonald’s has been testing its version of the order-ahead app in Georgia, Taco Bell is expected to be the first company to to fully unveil its product. As with the McDonald’s app, Taco Bell’s new program won’t exactly mean a super speedy trip to the local fast food joint. There are a number of things that could get in the way including still waiting in line for your meal during high traffic times or being met with cold tacos – nobody wants that. “Consumers have told us they continue to look for the experience that meets them where they are and to customize it to what they want and how they want it,” says Brian Niccol, president of Taco Bell, told USA Today about the new app.